The West Hawai‘i Community Health Center (WHCHC) is a vital partner to the Hawai‘i Public Health Institute (HIPHI) in Hawai‘i County. As an active ally for both Tobacco-Free Hawai‘i Island (TFHI) coalition and the Hawai‘i Island Healthy Eating + Active Living (HI HEAL) network, the health center provides leadership and guidance in the areas of tobacco prevention and control, the built environment, worksite wellness and the promotion of physical activity and nutrition. WHCHC recognizes the importance of respecting the diverse beliefs and values of the vulnerable populations and underserved surrounding communities. One of the health center’s key programs, under the Department of Innovation and Transformation, is the Community Outreach and Education Program, led by Jasmin Kiernan, RN. Kiernan and her staff serve as cultural brokers, advocating for the needs of West Hawai‘i and providing programs focused on addressing and improving health and wellness. 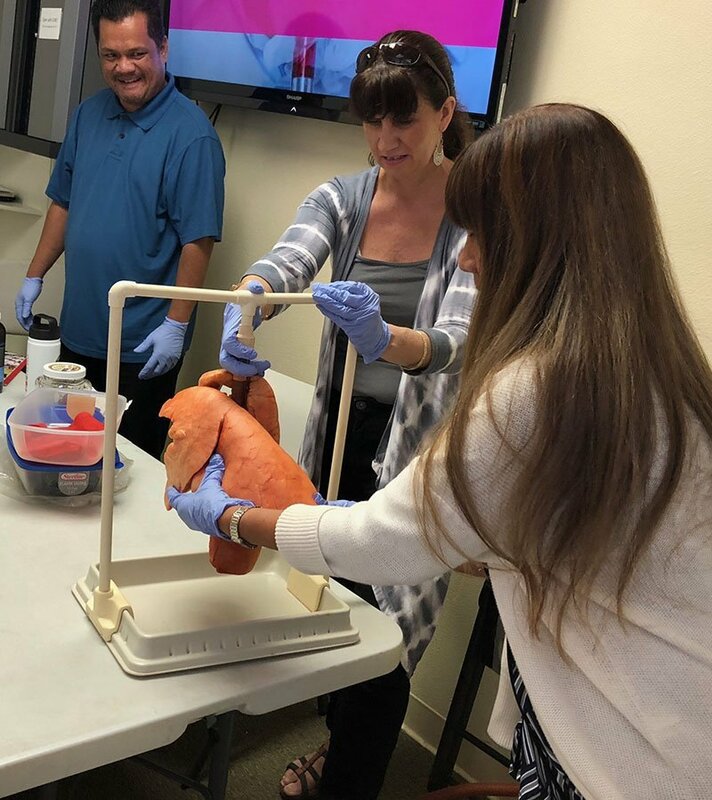 Recently, 12 WHCHC staff were trained as facilitators in a tobacco prevention program developed in collaboration with the University of Hawai‘i at Hilo School of Pharmacy and the Tobacco-Free Hawai‘i Island coalition. The educational program focuses on tobacco and electronic smoking devices (ESD) prevention to grow awareness, increase knowledge, and empower youth with decision-making skills to say no. Staff presented to different grade levels from Kindergarten to fifth grades at Kealakehe Elementary, including Honaunau Elementary and Ehunuikaimalino schools. Staff also organized two youth advocacy programs to address change to the built environment (roads, walking paths, etc) in West Hawai’i. Their team hopes to expand its scope to more schools as vaping continues to increase among students throughout Hawai‘i County. The WHCHC Outreach team is often found at community health fairs and other events sharing smoking cessation materials for the public and encouraging them to participate in WHCHC’s Tobacco Cessation Program, which offers free nicotine replacement therapy (NRT). WHCHC also recently introduced the Baby and Me Tobacco Free Program, a smoking cessation program created to reduce or stop tobacco usage among women during the prenatal and postpartum period. The Diabetes Prevention Program (DPP): Sixteen weeks of weekly classes followed by monthly checks up to a year. Their goal is to have clients lose at least 5% of their weight and to take charge of their diet/nutrition and increase their activity level. Self-Management Blood Pressure Program: Another component of the DPP is supporting people with hypertension by providing free blood pressure monitors for people diagnosed with hypertension willing to take part in the program. As a component of this program, Hula for Health, Ola Hou I Ka Hula, is provided weekly at Hale Halewai to encourage participants to increase their activity through hula. A curriculum is provided with the hula, and blood pressures are taken before and after the class. Affordable Housing Units: WHCHC runs two youth groups at Ulu Wini Affordable and Transitional Housing and Kahalu`u Housing and provide monthly health topics at Ulu Wini. The team worked on a project called the Youth Engagement and Action for Health (to promote youth leadership by learning to advocate for themselves and their community. Each youth group chose a project after a built-environment survey, identifying a need within their environment. Presentations were then made to appropriate stakeholders, giving them an opportunity to propose a solution for an identified need. Family Wellness Initiative: provide monthly activities (ex: Zumba, volleyball, cooking demos, etc.) to promote increased activity and better nutrition for parents and children. Kona Paradise Club – provide monthly presentations for adults with mental health problems. We also provided the Diabetes Prevention Program for 15 clients. Monthly Safe Sleep Class for pregnant Moms and partners as part of Perinatal Support Services. Free Pack and Play cribs are provided for any pregnant Mom that participates. Farm outreach: providing free health screenings, health education, and enrollment assistance for affordable health insurance at various farm sites for farm workers and families. 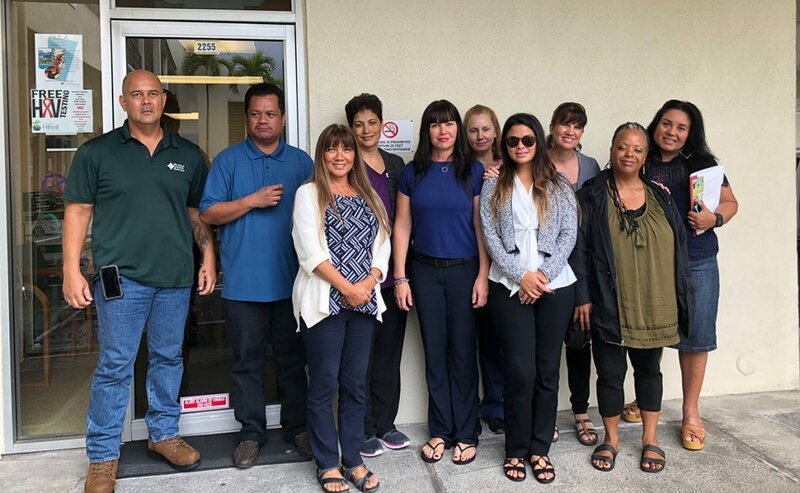 HIPHI is expanding its partnership with the West Hawaii Community Health Center, which will host TFHI’s 2019 planning retreat and will continue to deliver and expand the ESD prevention program throughout West Hawai‘i schools. HIPHI thanks WHCHC for their commitment to public health and making Hawai‘i County a healthy place to live.